Progressions Director Julie Rinard periodically shares stories about interactions with her students, which we post on our blog. Below, Julie recounts the program finally getting through to a troublemaker. Jesus is a kid who knows how to get under your skin. He is intransigent, an odd mix of apparent apathy and a bully. 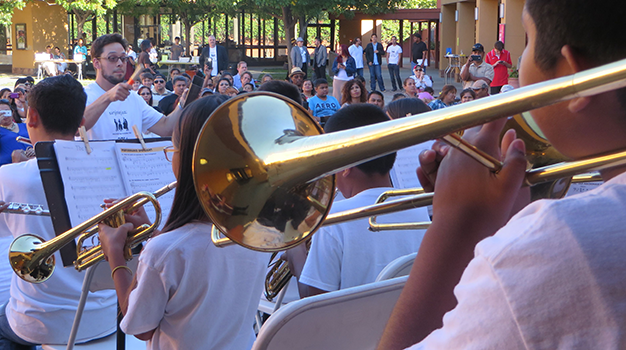 Throughout the entire 2014 spring semester at Santee Elementary School, Jesus was a daily distraction in brass class and his instrument teacher frequently had to separate him from his peers to maintain a positive learning environment. I called his mother and had several heart to heart talks with her about how to keep him enrolled in the program without destroying the learning environment for others. 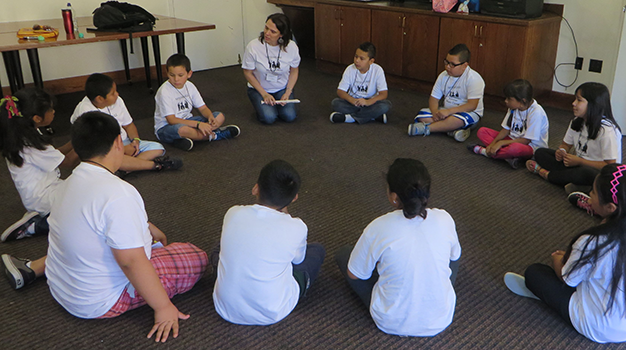 Despite my secret wishes, Jesus and his sister showed up with 48 other Franklin-McKinley and Alum Rock School District students on day one of Camp. But instead of writing him off as a lost cause, the Camp staff launched a full-blown frontal attack on Jesus’ bad attitude. When Jesus slouched, Miss Jane whispered in his ear, “Both feet on the floor, chest lifted, shoulders back.” When Jesus stopped playing in the middle of a sectional, Mr. Gary reminded him that everyone should be playing together. When Jesus refused to participate in the morning all-Camp activity, Chili, Chili, I stood by him in the circle while chanting and dancing in an exaggerated manner to show him that we were all taking risks together. When Jesus took someone else’s sandwich during lunch, Miss Meg made him apologize and reminded him that community members always look out for each other. And when Jesus played a section of a song exceptionally well, we fell all over ourselves to tell him what an amazing job he had done. Near the end of week one, we realized our strategy with Jesus was not working. How could we motivate Jesus? Our proposal: re-engagement by grounding Jesus more firmly in the aspirational quality of music. Miss Jane suggested we take him to observe the Summer Jazz Camp trombone master class. The next morning, Jesus and I slipped quietly into the class. Trombone instructor Dave Martell was showing YouTube clips of some of the great trombone players of the 20th century. During our five-minute observation, Jesus slowly slid down the back of the wall and ended up in a heap on the floor. After class, I invited members of the class to share why they like the trombone and play a tune. At first no one volunteered. But then, one by one, the horn players came forward. In the end, all but a few players stayed. I could tell by the way these kids held their horns that they were proud. And I could see that they were emotionally and spiritually connected to their instruments; it was almost as though the shape, sound and feel of each trombone was a personal expression of its owner. At the end of the song, I clapped and thanked the kids for giving up their break. I asked Jesus to do the same. To my dismay, he looked down silently, refusing to communicate. He left the classroom without any form of acknowledgment or admiration for what he had witnessed. After Jesus had returned to class, I felt defeated. I vowed not to invest any more emotional energy in helping turn him around. 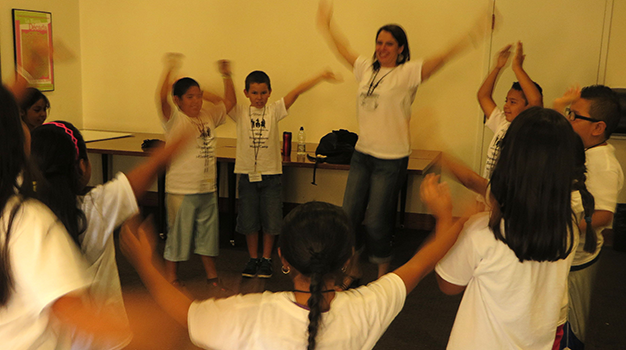 The following week we did an enrichment lesson that focused on helping kids identify their passions. When I asked the entire group what a spark was, Jesus raised his hand excitedly and shared that it is a fuse that ignites something else. A few days later, I shared the story of my sparks. Afterwards, the kids did a brainstorming exercise during which Jesus shared that he loves chemistry and hopes to study it in college. I saw Jesus last week when I went to Santee for the weekly summer music classes. When I greeted him and asked how he was doing, his face lit up. Later Miss Meg (who works with the Catholic Charities of Santa Clara County summer enrichment program at Santee) shared that Jesus told her that he misses going to Camp every day. I take it back; perhaps I will invest a little bit more emotional energy in Jesus in the coming year. Learn more about the Progressions initiative by visiting the Progressions page on our site. Additionally, if you or someone you know has an instrument they’d like to get rid of, consider donating it to Progressions. Our ongoing instrument drive is still accepting donations. 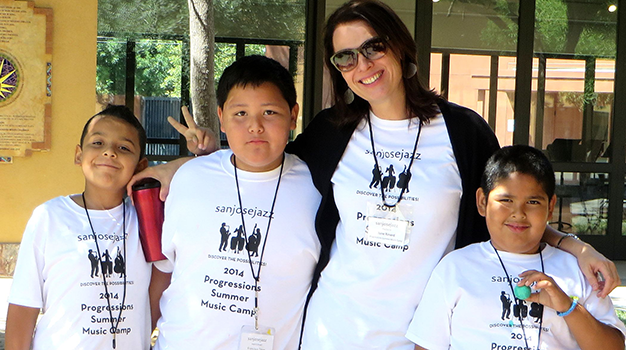 Find out more by emailing instruments@sanjosejazz.org or by visiting our instrument drive page.